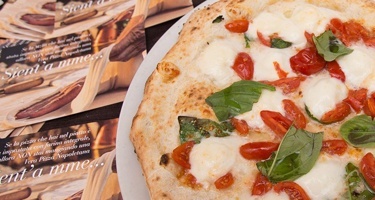 It is increasingly higher the group of AVPN pizzerias in Italy and worldwide. With the "Pizzeria del Viale" of Modena we reached 535 members, but now we move to the faraway Norway, precisely on the cold sea of Kristiansand to deliver, in May, the first Norwegian label to "Villa Marina" in which team there is Tommaso Mastromatteo, Maestro AVPN. During the same month we came back to Italy, in San Dona di Piave,at Piazza Indipendenza, where once there was the Caffé Grande, there is now a Pizzeria Verace. We’re talking about "Nonna Giovanna" whose name is dedicated to the great-grandaughter of Luigi called "Scignatella" that in the late nineteenth century already used to move around the streets of Naples with its popular pizzas. It was instead given to the Pizzeria "' O Scugnizzo", in the historic center of Arezzo, the label no. 538: the second one certified with the gas oven in the world. In addition to an excellent verace you can admire the frescoes of the "Legend of the True Cross" by Piero della Francesca just a few steps from the pizzeria. On May 22 an intercontinental flight to deliver the next label to "Queen Margherita Of Savoy", in Cronulla in the southern suburbs of Sydney: the first pizzeria AVPN in Australia where we find Giulio Abussi, tutor of the Association for two years. The same continent for "Crown Gradi" that in the city of Southbank, region Victoria (Oceania), follows close behind the recognition of Queen Margherita. Back to Italy in the veracissima Naples, Salvatore De Rinaldi gets the second label AVPN for the new versatile restaurant, the B-Zone in Quarto while the newly born society of the well known Salvatore Santucci and Giovanni Improta is launching, in Pozzuoli, a new ambitious project with the pizzeria and dough lab "Ammaccamm". But, to complete the list of newcomers, we must go back to Australia, where the pizzeria "Double Zero" gains, after a few days from the fellow countrymen, the third certification of AVPN.